The KV-N1058X is one of three scanners in Panasonic’s new network scanner lineup. All scanners in this lineup offer Gigabit Ethernet connections and Wireless LAN capabilities, to help you save time and speed up your document management processes. Enjoy the ease of scanning from a PC with no USB connection required, to a mobile device, or directly from the Panasonic KV-N1058X. 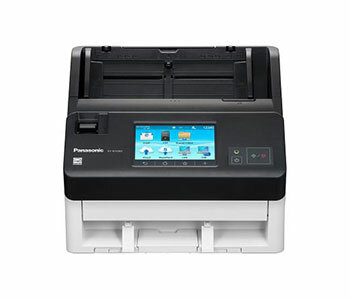 The variable network connectivity of the Panasonic KV-N1058X allows you to connect the scanner to your PC or mobile device over wired or wireless connection according to your business needs. The need for large installation space, and the cost for more PC's are eliminated. This means it also saves you operation cost. Send your scanned data safely and securely with the advanced network security features. The Panasonic KV-N1058X come with encryption technology that supports SFTP and SSL communication. They also feature User Authentication and Access Control to provide a high level of security to multiple users. 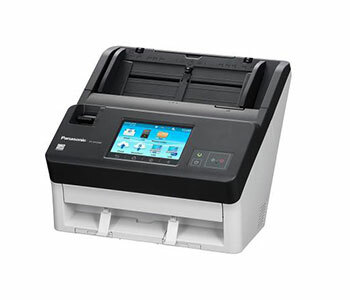 Scanning various documents is made easy with the Panasonic KV-N1058X. No more problems when scanning long paper, passports, bankbooks, or even embossed cards at once!